Here is my explanation. If you readers have anything to add, please post it in the Comments below. Thanks. Thanks. Beautiful images. Full of biblical representation — NOT pagan influences. They are devotional images to remind Catholics of the sorrows of Jesus and Mary and the resultant purification, joy and new life that come from them. Hearts represent love and life as the center of our being. 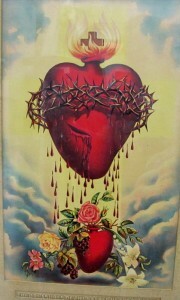 Jesus’ heart beats with the fire of love (at the top of the heart) which was demonstrated at the cross. The fire also represents the purifying fire of God by which he purifies men. It exudes the transformative power of divine love. The crown of thorns brought suffering which was endured for the love of man to redeem him — to bear man’s pain in his own heart. The cut in the heart is that made by the lance that was thrust through his heart when he was on the cross. The blood dripping represents the new life secured through his death (life came through dead). The Blood of Jesus also cleanses us, washes us from sin. The result is the heart of man (below surrounded by flowers) is given new life. The flowers represent a garden of delights, new life, freshness. The Garden of Eden which brought about death by sin is now replaced by the Garden of Heaven which brings new life because of holiness and the work of Christ. Adam and Eve experienced death at the Tree of Life in the Garden of Eden; The New Adam (Jesus) brings about life at the Tree of Death (the cross) in another garden (John 19:41). This cross is at the top of the heart. Heaven and the glory of God is represented by the clouds and the blazing sun or heavenly light from God behind the hearts. 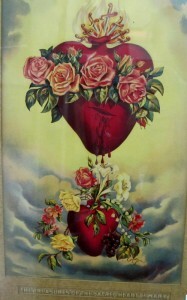 This one is similar to the Sacred Heart. The roses surrounding Mary’s heart represent her sinlessness and purity, sweetness and new life. The seven swords piercing the top of the heart represents the “Seven Sorrows of Mary,” (“Mater Dolorosa”). The first of her sorrows was the Prophecy of Simeon that a sword would pierce her soul because of her son’s death (Luke 2:35), 2) their flight into Egypt, 3) the loss of Jesus in the Temple; 4) the fourth sorrow is Mary watching Jesus carry the cross, 5) the crucifixion imagining a mother watching her son die this way; 6) receiving his limp, cold body after the crucifixion, 7) the body of her son buried in the tomb. When Mary and Joseph took Jesus to the temple as a baby the prophet Simeon said that the life and death of Jesus would be like a sword that would pierce her soul (Luke 2:35). 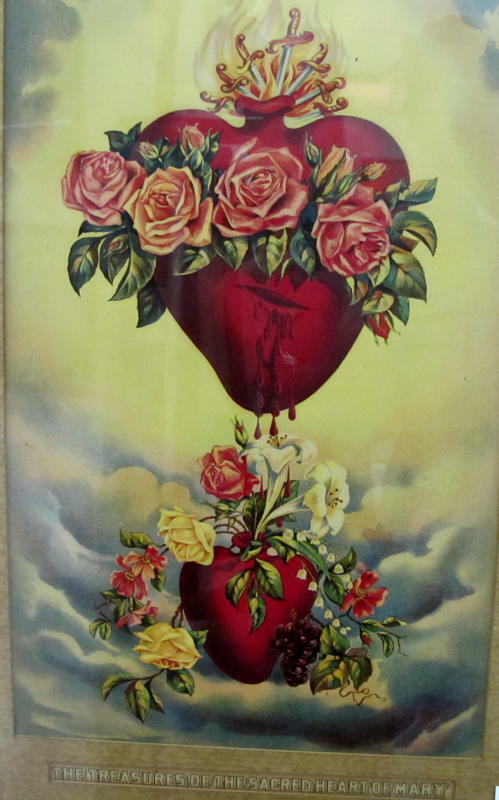 The lower heart, the one of Mary surrounded by roses, shows a cut in it which is symbolic of her sorrows. But her sorrows have brought us new life and pure hearts represented by the garden of roses below. The mystic rose, symbolizes Mary’s mystical participation in the Holy Trinity as Heaven’s Rose or Mystical Rose. In medieval times the mystic rose symbol was drawn with four petals on a stain glass background or on a multi-colored background like a popular quilt pattern which is still stitched today.